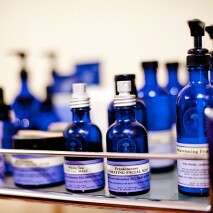 Using Neal’s Yard Remedies and Perfector Skincare Products. Perfector Non Surgical Face Lift – A non invasive alternative to a surgical facelift. Builds facial muscles which tightens skin, reduces lines, puffiness and dark circles. A course of 12 treatments is recommended. Quantum Wave Laser Facial – Rejuvenating treatment using cold laser technology that is completely non-invasive. Great results for fine lines, broken capillaries, acne prone skin and much more. Courses of treatments are recommended for best results.